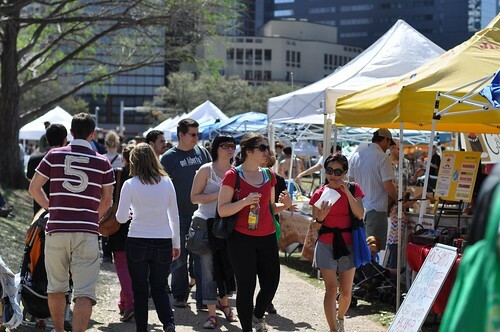 My food-centric wanderings in Austin were made a bit more complete with a visit to the Downtown farmer’s market. I approached the market on that sunny Saturday morning, surprised to find the quiet little park that I’d walked by over the past couple days suddenly full of color and life. My belly was empty when I left the hotel and I was hoping to find a late breakfast. There were stands with carrots and greens, jams and honey, handmade soaps, pastries, but nothing ready-to-eat and gluten-free. I had almost made my way past every stand when I came upon this one. Why hello, Tacodeli with your gluten-free options. I hopped in line behind half a dozen other people, with half a dozen more lining up behind me. A thin, scrappy man with wild gray hair stood behind a table filled with insulated bags of foil-wrapped tacos. As I stood in line, I watched him slap “SOLD OUT” notifications over the different options and hoped there would be something good left when my turn came. When I got to the front, I ordered a gluten-free portobello taco: roasted portobellos with roasted poblano peppers and sautéed onions on a soft white corn tortilla (the GF tacos all came without cheese, I’m assuming to cater to dairy-free customers as well). I took my little taco and found a grassy spot to sit. It was a such a simple meal, and I enjoyed it slowly as I sat there in the sun watching people go about their day. As I ate, I imagined that the man at the taco stand roasted the peppers and caramelized the onions in my taco by hand. 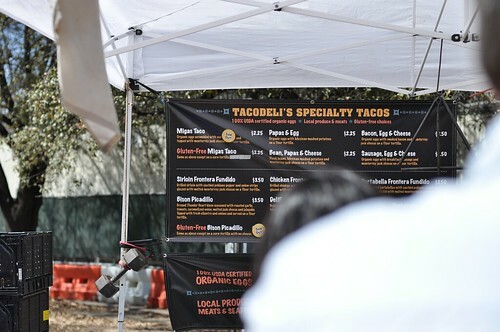 That he worked hard every Friday night and into Saturday morning to bring warm, fresh tacos to the greenmarket. That he felt a sense of pride at the lines and satisfaction every time he pinned up one of those medallions declaring that yet another of his tacos had sold out. I couldn’t wait to recreate it in my kitchen at home. And after I got home, a quick internet search burst my bubble when I discovered that Tacodeli is actually a restaurant in Austin. With three locations. And delivery service. I felt disappointed—in part because of my deflated fantasy, but in part because the taco was delicious and I was sad to have missed visiting the restaurant. I guess I can put it on my list for next time. And now you know about it too. So my disappointment was brief—especially since stopping by that stand inspired me to create what Chris has claimed as one of his new favorite dinners. My version of these tacos is a little different but still wonderfully simple in composition: seared mushrooms, roasted poblanos, caramelized onions, and a little cheese (naturally). They’re just the thing for these warming days, and, once summer arrives, will be perfect for eating as you plop down in the grass and let your mind wander. b) Turn a gas burner on medium high heat. Set a pepper over the flame and, keeping a close eye on it (holding constantly with tongs if necessary) allow to blacken on all sides. Once the peppers are blackened, immediately transfer to a glass bowl and cover with tightly with plastic wrap. The wrap will trap the heat from the peppers, creating steam and loosening the skins so that they are easy to remove. Once they’ve cooled enough to handle, use your fingers to slip the skins from the flesh. Pull the pepper tops off and scrape out the seeds. Slice the peppers width-wise into ½” strips. Preheat a cast iron griddle or a large skillet over medium high heat. 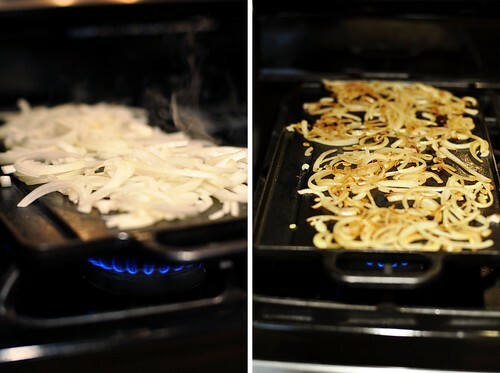 Drizzle with a small amount of oil and add the sliced onions. Season with Kosher salt and sauté until softened and deeply golden. Transfer the onions to a bowl and set aside. Brush the portobello caps with olive oil on both sides and cut into ½”-thick slices. Place the slices on the griddle (or in the skillet) and let each side sear until browned and the mushrooms are tender. Remove to a plate and set aside. Turn off the heat and place as many tortillas as will fit in your skillet or on your griddle. Warm on each side, just until softened. Repeat with all six tortillas. Place on a plate and cover with a clean dishtowel to keep warm. 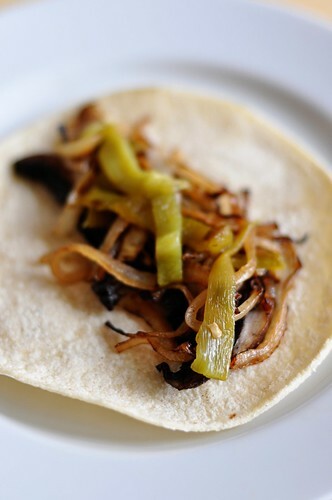 To assemble the tacos, place a few slices of mushroom in the middle of a tortilla. Top with caramelized onions and pepper strips. Finish with a sprinkling of grated cheese and a few dashes of hot sauce, if using. To make ahead: Assemble the tacos on individual pieces of foil. After placing the ingredients on each taco, fold the sides of the tortilla over the filling. Fold one side of the foil over the closed taco, and hold the taco together as you roll it across the other side of the foil. Twist the open ends of foil closed and place in the refrigerator. When ready to serve, reheat in a 375-degree oven for 15 minutes. *I prefer method “a” for roasting peppers because I feel that it requires less babysitting, but, by all means, roast your peppers however you feel most comfortable.